I took this photo when I was “homeless” living in a friend’s basement for a couple weeks while my boyfriend and I looked for a new home, so I apologize. Please check out the original post over at Mel’s Kitchen Cafe for beautiful pictures! Either way, this meal was too delicious not to post. This is a great summer meal. 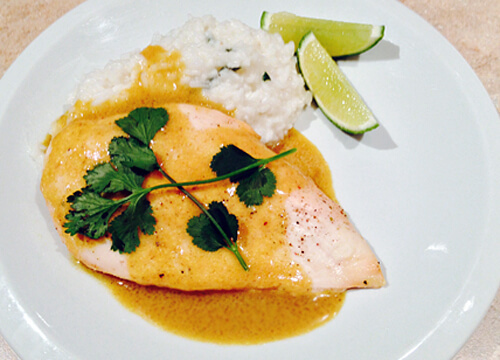 The acidity in the lime balances the creamy coconut milk perfectly for a perfect meal! In a large bowl, combine the oil, lime zest, lime juice, cumin, coriander, soy sauce, salt, sugar, curry powder, coconut milk, and cayenne pepper. Place chicken in the marinade, cover and refrigerate for 2-8 hours. When ready to cook, add the rice, coconut milk, water and salt to a pot and bring to a simmer. Cover, reduce heat to low and cook until rice is cooked through (about 15 minutes). Preheat the grill (or oven if your are baking the chicken). Grill the chicken about 7 minutes per side, or until the internal temperature reaches 165F. While the chicken is cooking, reduce the marinade in a small pot over high heat until desired consistency is reached. To serve, pour sauce over the chicken and rice. Serve with fresh minced cilantro and extra lime if desired.